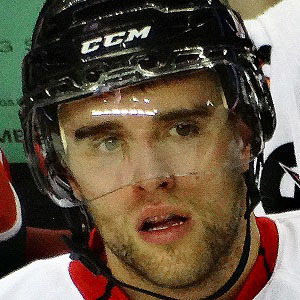 Canadian defenceman who was selected by the Florida Panthers with the first overall pick in the 2014 NHL Entry Draft. He received the Calder Trophy as the NHL's top rookie following the 2014-15 season. He was born in Windsor, Ontario and played for the Sun County Panthers minor midget AAA team for the 2010-11 season. He won numerous individual awards with the Barrie Colts in the Ontario Hockey League as well as a gold medal representing Canada at the 2013 Ivan Hlinka Memorial Tournament. His brother Darien was a professional goaltender with the London Knights in the OHL. He became teammates with fellow first-round Panthers draft pick Aleksander Barkov in 2014.